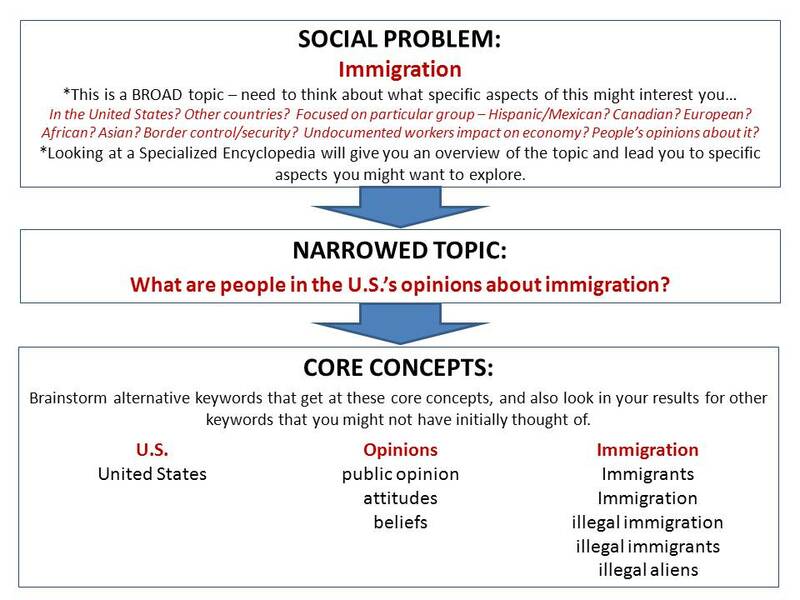 Permission to use "Moving from a Research Question to a Search Strategy" model and worksheet by Mandy Swygart-Hobaugh was granted and licensed under a Creative Commons Attribution-NonCommercial 4.0 International License. Some "alternative keywords" (such as "public opinion," "attitudes," and "beliefs" in the example above) are obvious. Others, especially subject headings and other technical terms, may not be. When you are building and expanding your lists of synonyms, be encouraged to use the tools available in online resources. WorldCat Discovery - find a highly relevant book, click on the book record, click on the Description drop down, and then scroll down to see a list of Subjects. These are linked so that you can run quick single subject-searches in WorldCat Discovery to check results. Even better would be to gather the Subject Headings and fit them into a broader search strategy. Library of Congress Subject Authority Search. This searchable index of subject headings. For example, when you find a highly relevant book in the catalog (WorldCat Discovery), click on the book record, These Subject Headings can often turn up far more, both in terms of quantity and relevance, than mere keywords can. Find below a link to a blank worksheet with which you may go through the process of moving from topic to search strategy. Feel free to fill it out and send it to a Reference Librarian for feedback or to use during a research consultation. Below are two Automated Search Strategy Builders, tools designed to teach you and help you create a search string using Boolean logic. Basically, in order to get relevant information out of databases, you need to be able to ask for that information in a specific way using the language understood by those databases (Boolean). The first Automated Search Strategy Builder is a web based version that allows for the use of up to 3 concepts and up to 3 synonyms for each concept. Simply enter the concepts and synonyms into the boxes below, click the button, and watch your Boolean search string come into existence in the box below. Be sure to put quotations marks around any phrases! Once you have generated the Search String, copy and paste it into a catalog or database search interface/box (such as ProQuest, Ebsco, JSTOR, etc.) and observe the results. Keep tweaking the concepts, synonyms, and search strings in your searches in order to hone your results, and be encouraged to keep a record of each search string you run and where! The Search Strategy Builder was developed by the University of Arizona Libraries and is used under a Creative Commons License. Another automated Search Strategy Builder, developed in a Google sheet by CST student Jim Chen and CST librarian Mark Bilby, does the same thing, except that it automatically inserts quotation marks around phrases and allows for up to 5 concepts and 10 synonyms per concept. It also makes it easier to keep track of your searches, since you can easily copy and paste each search into a new cell or a new tab. 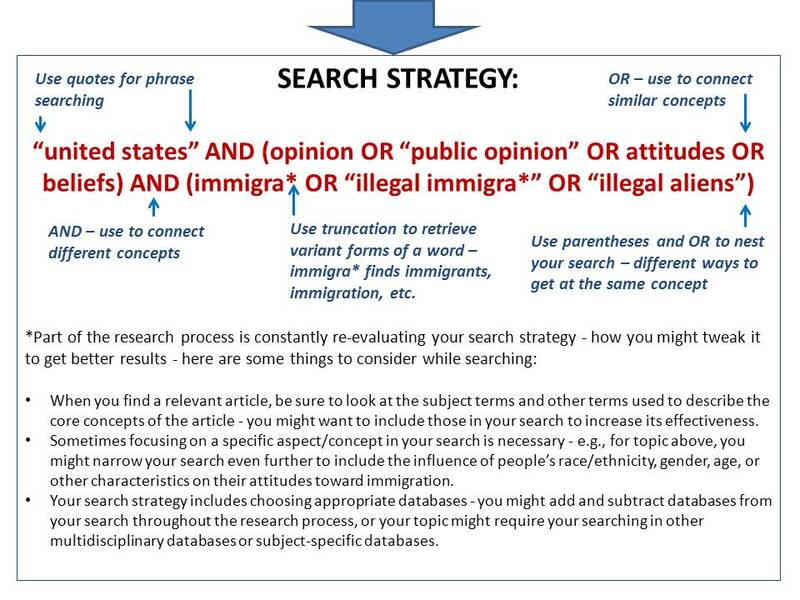 Search Strategies LibGuide by Mark Bilby is licensed under a Creative Commons Attribution-NonCommercial-NoDerivatives 4.0 International License.